Below is our review of the Acer Aspire V3-571, a 15.6" laptop, featuring 6GB RAM, 500GB hard drive and Windows 8. 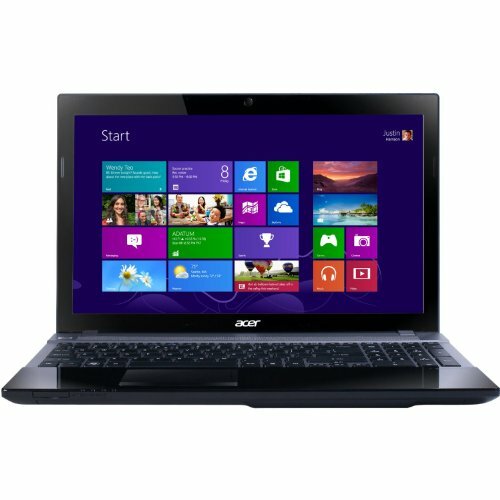 If you are looking to spend around £400 on a new notebook, and are unsure which one offers the best value for money, then you can do a lot worse than look at the latest models from Acer - renowned for offering excellent value for money, and decent specs, the Acer Aspire V3-571 looks on face value to continue this reputation. The outside of this laptop has a black glossy finish, which although looks pretty good straight out of the box, will have a tendency to pick up finger prints, and thus need the odd wipe in order to keep it's new looks. Typically understated in design, it should date well, and the specification is where the main attention has been put into. Featuring Intel's Core i5 3210M model processor, operating at 2.5 GHz, which is generously coupled with a huge 6GB RAM, as well as a substantial 500GB hard drive, albeit running at 5400RPM rather than the preferred faster 7200RPM. Despite this, we did not notice any speed issues with this hard disk, and were overall impressed with the general performance of this Acer laptop. Multi tasking was handled with ease, and the 15.6" display offered a beautifully crisp picture, with colours being displayed accurately and vividly. All of our testers agreed that this laptop offered a great deal of computing power especially considering the relatively small price tag. The laptop measures a total of 38.2cm by 25.3cm by between 2.5cm and 3.3cm in depth - and weighs a competitive 2.6kg - small enough to just about fit in most backpacks, thus giving it a degree of portability. The built in multi-card reader offers SD, MMC, MS, MS PRO and xD connectivity - so enough for the majority of users, and the Acer Crystal Eye HD webcam lives up to it's name, providing a decent picture for those who wish to use Skype. Windows 8 is the supplied operating system, and as this is the standard for laptops of this price range, we shan't comment on this aspect of the laptop package. The battery performed well and provided an impressive amount of battery life for a notebook costing this little. Input duties were admirably handled by the keyboard and touchpad - both offered accurate input, and were liked by all members of the test team. So what did we think overall? Pros: Very impressive spec for the money - well worth considering. Cons: Exterior will show fingerprints - a pretty small issue. Overall we loved the Acer Aspire V3-571 - if you have the money then you can do a lot worse than this laptop.